Aurora Borealis from airplane and meteor (Flight Moscow-Vladivostok, October 31, 2018) over Russia. Canon EOS 60D: f/3.5, ISO-5000, 18 mm, 8 sec. exposure. Without tripod. The track of the meteor is visible at the 00:23 second of this video https://www.youtube.com/watch?v=pc-Edl2C5Ro (time-lapse; from Canon EOS 60D) from the same author. 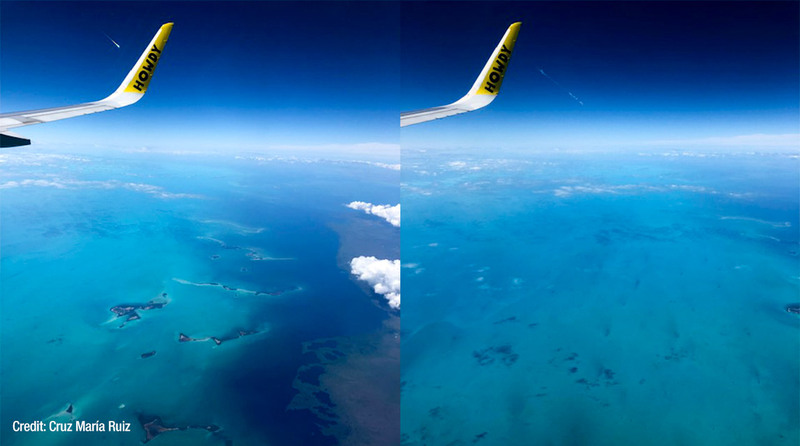 This week, we received another amazing photo (2 photos actually) of a meteor taken from a plane. But this time, this is not a random meteor, the photo shows the meteorite dropping fireball that occurred over Cuba on Friday, February 1st, 2019! Cruz Maria Ruiz was on her way to San Jose, Costa Rica from Orlando, FL (Spirit Airlines 923) when she took a photo of the fireball and another one of the resulting smoke trail. Thank you Cruz Maria Ruiz! Please, don’t hesitate to share you photos with us! Its amazing how the photographer was able to take the image from outside of the wingtip. A skeptic ought to be asking if it’s possible to take these photos from a significant distance away from the aircraft, or if instead the images may have been fabricated.